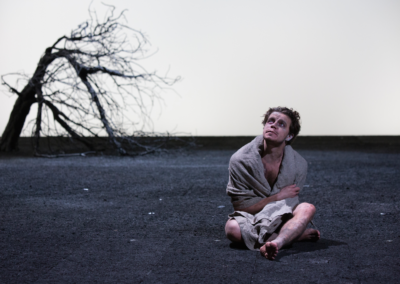 Featuring utterly spectacular design and building on this year’s powerful graduating ensemble, Gregory Doran tells the bleak and tragic tale of King Lear on a scale that is both grand and deep against a backdrop of mania and uncertainty. 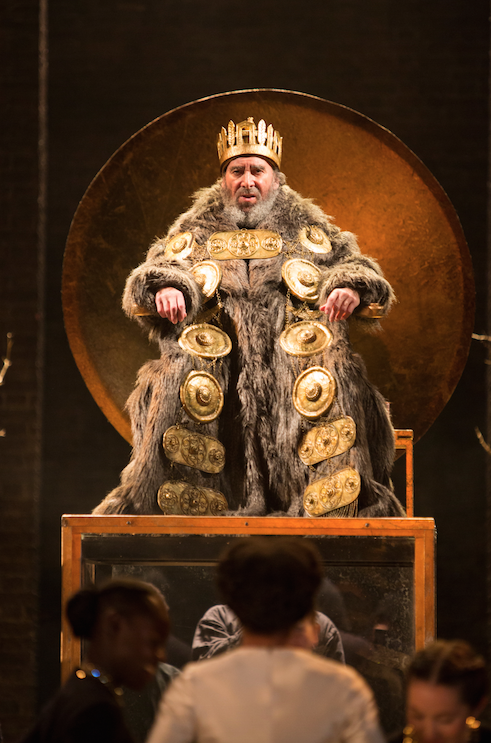 From the opening procession to the sheer mass of his cloak, Antony Sher’s take on the eponymous King Lear is larger than life. His commands hold a gravity that hint at the fury to come, and while at times his delivery can veer into melodrama against the more naturalistic ensemble, when it fits it is utterly terrifying. But the true force of Sher’s Lear both as a frightening and sympathetic figure comes from his control, showing a reluctant remorse over his opening actions long before many of his predecessors. When confronted by both the Fool and his daughters his violent rage can be seen simmering beneath the surface, but it blends with a contemplative regret that manages to amplify the tragedy. Nia Gwynne’s Goneril also comes across as an almost tragic figure in her own right. Early moments of compassion appear more genuine than her traditionally sympathetic husband, and her caution surrounding her father shows to be completely well founded. The scenes of him lashing at her in a violent rage can be difficult to watch as the silent onlookers stand by passively and she struggles against tears. In the midst of her despair, her fixation on Edmund and later plots appear less vindictive and petty and more understandable, hopeless desperation. In contrast, Regan steers closer to traditional portrayals, with her saccharine composure barely masking her ruthless, selfish cruelty. Kelly Williams gleefully plays up her malicious side, yet in a play consumed with chaos and madness stands out by never losing her own sense of control. 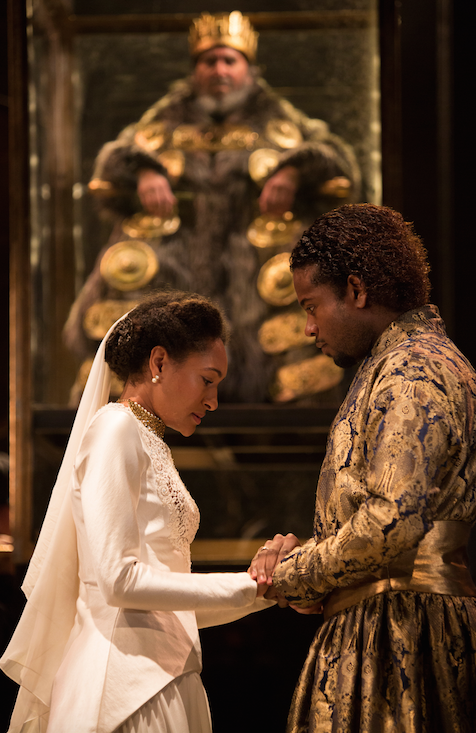 After major roles in both earlier RSC productions, it is easy to see Natalie Simpson’s Cordelia as a melding of the tragic honesty of Ophelia and the wild warrior princess Guideria from Hamlet and Cymbeline respectively. Yet alongside Sher’s unique take, the youngest daughter’s greatest similarity is to her father, with gold hiding scalding iron that cements the bond between them. David Troughton’s Gloucester often mirrors Lear’s journey throughout the play, going from pride to unjust rage to pure misery. His torture is even more disturbing than usual in its place within a glass box, making a spectacle of someone who soon will be unable to even witness it. But it is after this scene that he reaches his heights, crumbing in guilt and despair as he realises he has both betrayed and been betrayed. 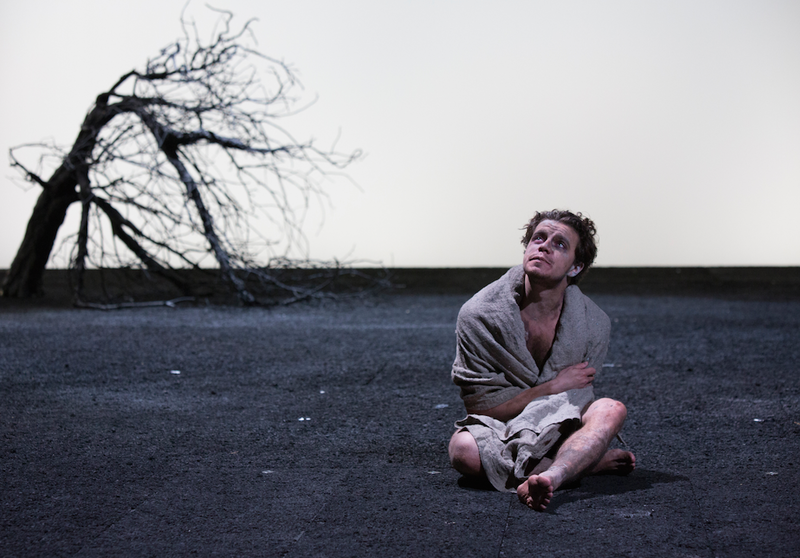 After a truly repulsive take in Iachimo in the last screening Cymbeline, Oliver Johnstone’s first scene as Edgar paints his carefree nature in a darker light, with Edmund’s bitter view of him seeping into the audience. But he rapidly evolves into one of the performance’s most tragic figures as he masks his grief and confusion in a desperate plight to not only stay alive but attempt to reverse the tragedy. His brother travels in the opposite direction, with Paapa Essiedu’s running commentary as Edgar morbidly delighting the audience with a skill carried over from his starring role in Hamlet. Yet his humorous role is bookended by jealously and bitterness as he laments the injustice of his illegitimacy, and his final change of heart appears less a complete personality backflip and more of an extension of his scorn for those who refuse to take charge of the consequences of their failures. Antony Byrne also shines as a fierce, blunt and cunning Kent. While his undying loyalty to the King can often create moments of cruelty that the interpretation chooses not to justify, he shows a softer side in a closeness to Cordelia that in genuinely sweet – and given her apparent lack of interest in both her suitors, also very interesting. His transformation from his red mane and beard to his tattooed scalp is also drastic enough to make his close friends’ lack of recognition of him believable. Graham Turner’s fool melds raunchiness and bitterness as he struts around in a crest and his underclothes while heedlessly mocking the king. Byron Mondahl’s Oswald is also often very funny, and the sympathetic portrayal of his mistress Goneril almost extends to him. The large ensemble heightens the ritualistic grandeur of the opening sequence and adds an edge of danger to the drunken revels of the King’s soldiers. Combined with their early roles as beggars it places the lead characters in a more sympathetic position long before they take refuge with Lear and gains a greater care for humanity. Niki Turner’s design for the performance is spectacular, and the brief feature showing the sheer scale of RSC designers’ work is a fascinating insight that alone is worth a ticket. In a mostly subdued palette, the gold decorations on virtually every costume and much of the set truly shine not unlike the humour and warmth within the grim plot. 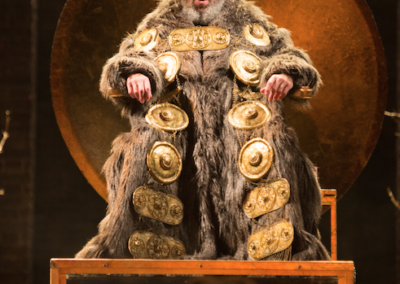 Lear’s heavy fur coat adorned with golden discs gives him an air of power and menace even when calm, and leaves him fragile and much more human after removing it. 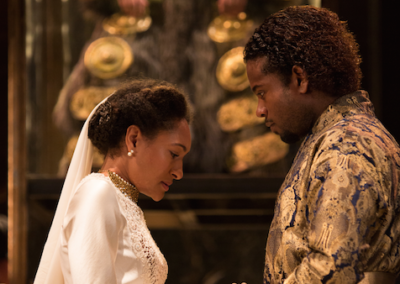 And while all of the costumes are gorgeously intricate, from the soldiers’ uniforms to Cordelia’s wedding gown, special mention must be given to Goneril’s opening dress, with trails of gold interwoven with the floral fabric. The set itself is often fairly simple, allowing the props to take complete control of the stage. Lear’s entry is a glory to behold, remaining aloft above his followers in a sea of gold in an awe-inspiring display that places his downfall on a god-like scale. The billowing, swelling storm is equally powerful as it threatens to consume both the actors and the audience, and the shadowed battle sequences allow fights to rage offstage as the central players remain in the forefront. With gorgeous visuals and fascinating takes on familiar characters, the climax of the 2016 RSC season is not to be missed. King Lear screens this weekend at Cinema Nova and Palace Cinemas. Antony Sher as King Lear. Images provided by Picturehouse Entertainment. Oliver Johnstone as Edgar/Poor Tom. Images provided by Picturehouse Entertainment. Natalie Simpson as Cordelia and Marcus Griffiths as France. Images provided by Picturehouse Entertainment.